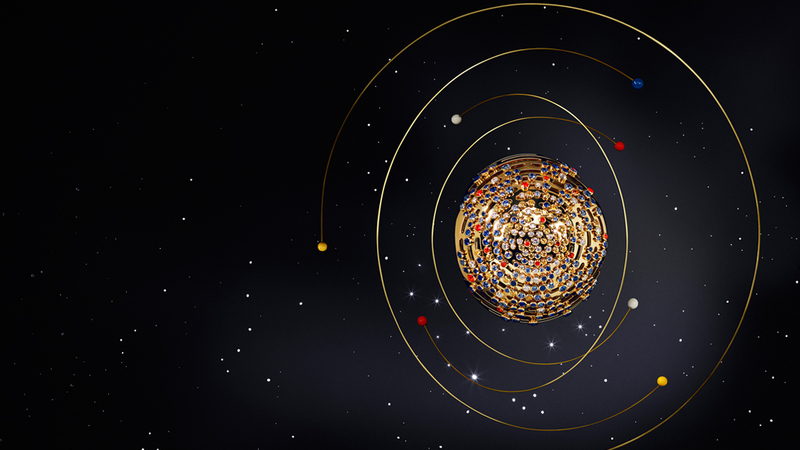 UNLIKE heavenly bodies in an infinite cosmos, Cartier’s new 13-model jewelry creations are far more limited in numbers. They are, however, as mesmerizing to look at as some of the phenomenon found in the skies. This isn’t as purple as it sounds; a cursory glance at any of the “Galaxy” pieces reveals Cartier has done something truly spectacular. Take The Alignment of the Planets bracelets as an example. The pieces are adorned by black Tahitian pearls, which are arranged like the axes of the sun, the Earth’s moon, Mercury, Venus, Jupiter and Saturn. 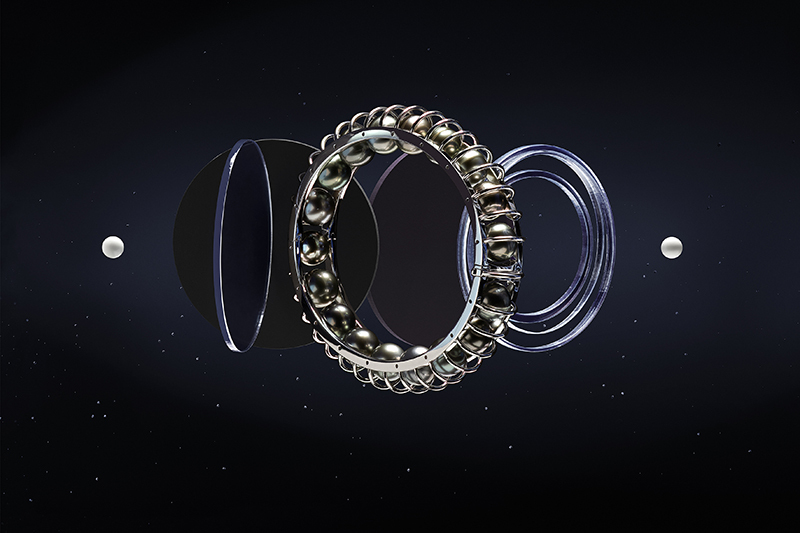 Caged within white gold bracelets, the pearls — which are actually more bronze green than black — can roll over their tracks to mimic the rotation of astronomical bodies. 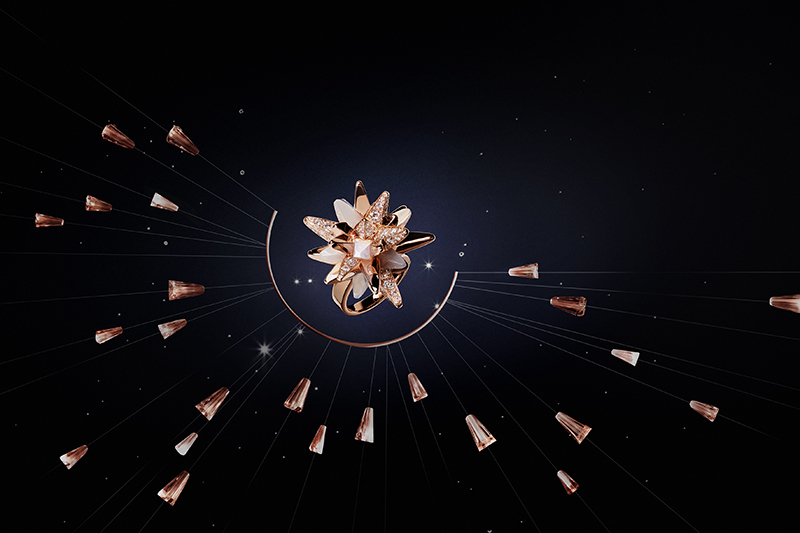 Fractal Meteor is composed of a ring, bracelet, earring, necklace and bag, all of which festooned with pink gold, diamonds, moonstone and milky quartz. The materials form irregularly shaped cones with square bases, which can reflect (or diffract) light coming from one another. Actually, what these cones look like are crystallized fragments of rocks that have exploded, sending them careering across space. 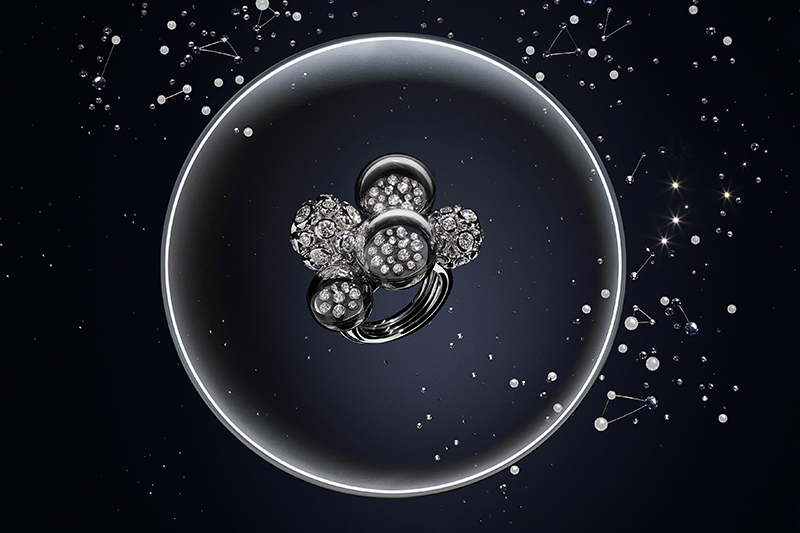 The ring, bracelet and desk clock that make up the Trembling Stars line see numerous pieces of diamonds set onto spheres, evoking solar systems — especially because of the black spaces between the differently sized diamonds. The diamonds are mounted via “serti vibrant,” or trembling setting, an original Cartier technique that lets the diamond move about within their bases — explaining the line’s name. Covering the spheres are domed rock crystals. Other materials lavished on these pieces are white gold and metaquartzite with pyrite. Where The Alignment of the Planets, Fractal Meteor and Trembling Stars rely on monochromatic sheen and irregular forms alone, The Earth’s Lights ring, bracelet and necklace bring in color — lots of it — to the equation. 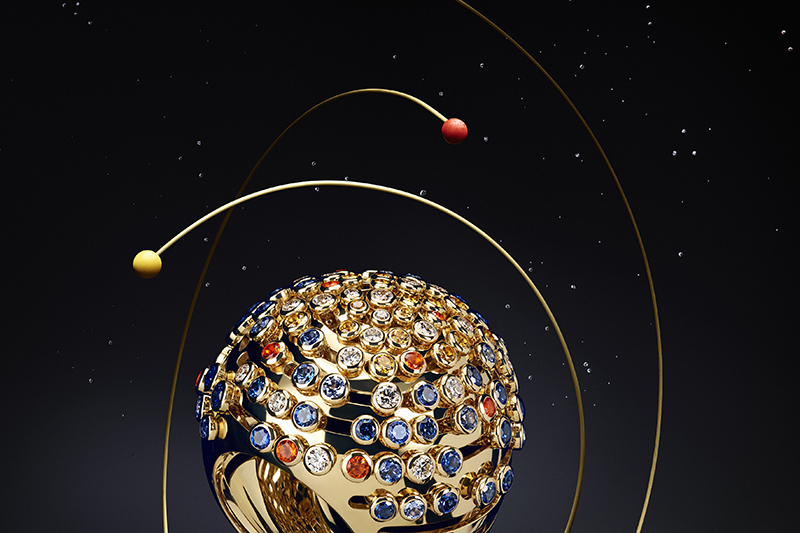 This touch, Cartier rightfully asserts, suggests a nighttime view of the Earth from space, thanks to vivid spots of sparkling red, yellow and blue elements. These colorful pieces are actually sapphires, opals and diamonds mounted on a rail radiating continuously, so the gems create the illusion they are bits of quivering light. No doubt, the effect created is, well, stellar.